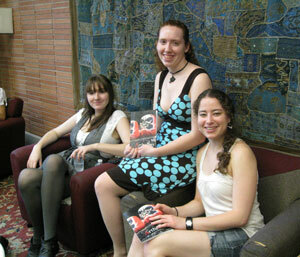 Hidden talents were revealed at the English department and Falvey Memorial Library’s sixth annual Open Mic Poetry Reading. Lisa Sewell, Ph.D., an associate professor of English, served as this year’s master of ceremonies and welcomed students, faculty, staff and special guests to the event, held on Wednesday, April 27, in the library first floor lounge. Kevin Speirs, 2011 Senior Class Poet Honorable Mention, contributed “Homes,” which has appeared on a poster displayed on Falvey’s first floor. Seniors seeking to become Senior Class Poet have one of their poems made into a poster. 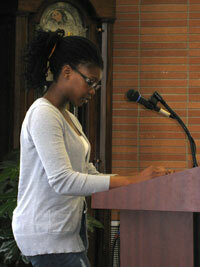 To celebrate National Poetry Month, fourteen Senior Class Poet contestants had their poems on display in the Library during April. Brittany Walker stepped up to the microphone next and offered “What’s Love Got to Do with It?” Mike Mo shared “Another Drive.” And Alexandra Edwards read “Because a Girl Is Not a Tree,” which has been published in Arthology. Special thanks go to Regina McFadden and the staff of the Library’s Programming & Outreach team for providing the chairs, tables for refreshments and for Arthology, and the microphone.